Sheikh Idris Abkar ( الشيخ ادريس أبكر ) are known for their recitation of Koran in beautiful voice. His voice is so emotional that many listeners feel it in their hearts. A lot of people search on Google for their complete recitation of Quran but until now there is no such website where you can find all of his recitation. So I decided to develop an application where all of his recitation can be merge & will be easy for people to listen to him at one single place. Sometimes when I feel down or I get some problems in my day to day life, I turned towards music. I listen a lot of music specially the slow music. Its been my hobby since second semester. I listen to music while coding. But at sometime when I get enough of it or I am not in mood of listening the same songs, I open another folder in Audios that is name as Islamic. In that folder, I have collection of some Naats, Hamds & some Surahs of Quran in Idris Abkar’s voice. I love his recitation. His voice goes deep into hearts. I tried to collect Quran in his voice. There are many websites that has his audios but almost all of them lacked proper structure. Finding surahs was hard there. And not all of his Quran was at same place. So I decided to put all of Quran in his voice at same place. For this I could have developed a website but a year & half ago [last months of 2013] I didn’t know how to code in HTML or how will I handle a website. It was like some rocket science stuff for me. The only option left for me was to create an application. Then I started to work on it in January 2014 in my winter vacations. But then I ran into some problems & university started again in February. Though I didn’t leave working on it but the pace of work get slower & slower. I even didn’t touched it for 2 months due to finals of fourth semester & its project BuySell (I’ll post about it later). After semester when I finally got free, I started to learn HTML & CSS. But then in August I started it again & completed it in a week by completely renewing the code. Enough with the background I suppose. Its complete Quran in Idrees Abkar’s voice. Its size is just 6 MB. It is an audio player that plays the audio from internet without downloading it. 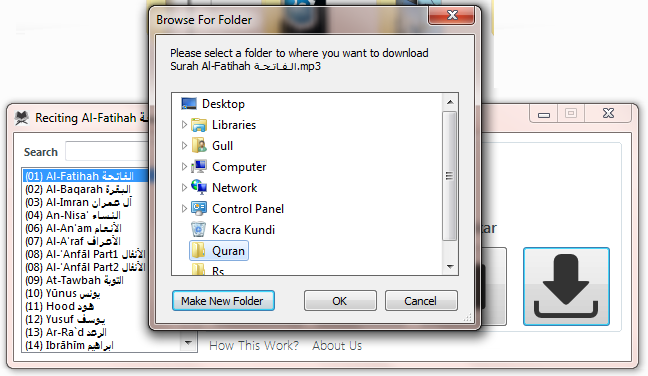 It has the best download feature, You can just simply click on download button to download any surat to your local hard-drive while you are listening to it. Every surat has its basic info with it. Madni or Makki, Total Ayats & Reciter. It has a search feature which took a day of mine coding. You can download this application. This setup is for both x64 Bit & x32 Bit Windows Operating Systems. Idrees Muhammad Abkar was born in Jeddah city in 1395 a.h. He started studding The Holly Quran from an early age in Tawhid Masjed at an age of only eight years old. After that, at an age of thirteen years, he joined the memorizing circles in Al-Fatini Masjed and finished memorizing the Holly Quran in four years. Then for the next three years, he was leading the prayer in the same masjed. His master Youssef Al Ahmady after ALLAH had the great merit on him. He also studied on such masters, for instance: Sheik Youssef Al Ahmady –Abd Wahab Al Ahmady – Odah El Zahery – Abd Allah Elqarny – Hady Said. The shaikh always mentioning their help and support for him; May ALLAH grants them the best of reward in this Dunya and the hereafter. Sheik idrees was the Imam of some of the masajid of Jeddah starting form Al- Fatami Masjed, to Ibn Taimia Masjed known as Masjed Al-Qahateen, to the Masjed of Osiad Ibn Alhadeer, then Ibn Alqaiem Masjed, to Seliem al Haraby Masjed and Bagaber Masjed. thanks for this complete quran in idris abkar voice. the download is not working properly. access denied. where is the code of this application ?